Anna Dewdney Writes Great Read-Aloud Books! There are some books that really come alive when read aloud. Anna Dewdey’s “Llama Llama” books beg to “said,” not just silently read. Each story about a young llama and his mama is rhyming and rhythmical with a lot of action words. You’ll find yourself pausing, shouting, whispering, speeding up, and dragging out words because the story is so packed with emotion. The two main characters are furry, long necked, lovable llamas. Young Llama Llama has a distinct personality that is quickly revealed in each of Dewdney’s six books about him. This little llama gets mad when things don’t go his way, such as when he has to share or take a long trip through a boring store. He has serious separation anxiety when he starts school. He is scared and lonely when he is tucked in at night to go to sleep. Llama, Llama is a typical young child! Going to bed isn’t so lonely when you know your mama is close by if you need her. Going to school isn’t so scary when you are assured that mama will be there to pick you up at the end of the day. In the most recently published book, Llama Llama doesn’t even need his mama’s help to learn how to share and makes a new friend along the way. Maybe this little guy is growing up! Anna Dewdney, the author and illustrator of these huggable llamas, lives in southern Vermont and spends her time writing, illustrating, and visiting schools and libraries. She has also written a handful of other children’s books and last year Dolly Parton made two of Dewdney’s llama books into a musical! When reading these llama books aloud with your young child play with the words and ham it up! Besides having fun, in each story you’ll learn about mama llama’s humble solutions to real-life family dramas. 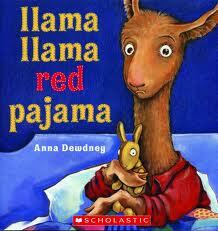 “Llama Llama Red Pajama” is the original llama book and has been a New York Times best seller. Young llama goes through a range of emotions when he is tucked into bed–scared, lonely, sad, mad, and worried! Mama reassures her son that she is always close by and then he is finally able to go to sleep. “Llama Llama Mad at Mama” When little llama has to suffer through shopping at the “Shop-O-Rama” he has a melt-down, starts screaming and flailing, and the groceries end up everywhere! Mama comforts her son and they clean up the mess and together look forward to the end of shopping. “Llama Llama Misses Mama” Llama Llama goes to school for the first time and feels lonely and teary-eyed. Playing with his new friends at school keeps him busy until mama comes to pick him up and he shows her around his new school. “Llama Llama Home with Mama” Both mother and son have to stay home for a sick day. “Llama Llama Time to Share” When a new friend comes to visit, Llama Llama isn’t so sure he wants to share all his toys. It’s time to celebrate all you dads out there! Father’s Day is your day to be recognized for all you do give the children in your lives the love, sense of safety and security, and the high self esteem needed to be all they can be! We thank you! “My Dad” by Anthony Browne. The illustrations in this book show an unshaven dad in his plaid bathrobe. He’s just a normal guy by his looks, but his son sees him as his super-dad and loves him through and through. The simple text is great for toddlers. “Pete’s a Pizza” by William Steig. Take a boy and make him into a pizza! Pete’s father starts kneading the dough (which is Pete), then adds some oil (which is really water.) He carefully adds tomatoes (checkers) and then tries to keep the pizza all together but it’s hard to do because the dough is a bit ticklish! “Knuffle Bunny” by Mo Willems. Using collaged photos with pen and ink drawings, Willems tells the tale of the little girl Trixie losing her favorite stuffed animal in the big city. Trixie can’t talk yet, so she has to somehow communicate to her dad what has happened. “Daddy Adventure Day” by Dave Keane and Sue Rama’. One smiley little boy and his dad spend the day at a baseball game. No cell phones or newspaper reading allowed! They take the train, get special snacks, and have fun at the huge stadium cheering for their team. “My Daddy and Me” by Amy E. Sklansky, illustrated by Ard Hoyt. Different dads and kids do activities together to show the variety of fun you can have with your dad. This endearing book has simple text and the short length is great for very young children. “Dad, Aren’t You Glad?” by Lynn Plourder, illustrated by Amy Wummer. A boy does all the “dad” stuff during the day. From shuffling cards, pushing the shopping cart, to cutting the grass, the son tries his best, but it’s a relief when dad can finally take over and do his jobs. “The Daddy Book” by Todd Parr. Parr uses his signature big bold colors and simple text to illustrate the diversity in who dads are and what they do. What makes us laugh? Something you don’t expect—like using a hammer made out of rubber to try to pound in a nail. Something out of place—like seeing an elephant taking a stroll in the park. Contrasting things put together—like watching a purple goldfish trying to ride a rickety red bike. When it’s a surprise, you can’t help but giggle! 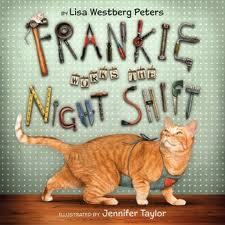 “Frankie Works the Night Shift” by Lisa Westberg Peters, illustrated by Jennifer Taylor. This orange tabby cat is very active in the hardware store at night. Frankie “helps” in his own way and counts as he does his work so there is the added fun of learning numbers. The illustrations, which are a combination of photos and drawing, are hilarious as they show what really happens when Frankie takes over the store. “The Dog Who Cried Wolf” by Keiko Kasza. A pet dog is bored with his life. Ho hum! But when he reads about the lives of wolves that get to hunt for their food and howl at the moon he wants to join the pack. He runs away, but finds out that it’s much cozier and easier to live at home as a dog. “Why Did the Chicken Cross the Road?” a book with 14 illustrators including Mo Willems, Tedd Arnold, Jerry Pinkney, and Marla Frazee. Each artist was asked to create the answer to that age-old chicken crossing the road question. You’ll see some very funny artwork with varied humor and illustration styles. “Samantha on a Roll” by Linda Ashman, pictures by Christine Davenier. Samantha puts on some roller skates and flies all over the town, collecting items from each person she side-swipes. She gets a butterfly net, a bridal veil, and then a kite. When she finally gets home she finds out that her mother didn’t even know she was gone!